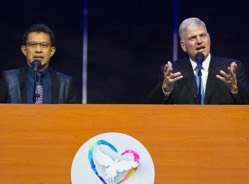 “There are many of you here tonight who are in danger of losing your soul,” Franklin said, aware that 95 percent of the country does not claim Jesus as Lord. Speaking from Luke 19, he shared about Jesus’ invitation to all people, including Zacchaeus, a corrupt public official who overcame obstacles to see Christ. Overhead, giant screens gave everyone in the seemingly endless line of rows the opportunity to have a close-up view of what God was doing. They didn’t have to climb a tree like Zacchaeus did to see Jesus pass by; instead, they could witness the presence of His Holy Spirit right there. This Holy Spirit is able to overcome any other spirit in the world. The Bible says God alone has the ability to rescue people from their wrongdoings—something other religions don’t offer. Rut came to the Festival after her neighbor Manewa invited her. She really just wanted to hear the music and expected to receive a blessing from Franklin’s sermon, too. Rut decided to rely on Him for protection and guidance instead of looking to herself or spirits. Through her newfound relationship with Jesus, she’s fully protected by a greater Spirit living inside her than any she’ll face on this earth—the Spirit of God—and promised eternal life in Heaven.